That's the sound we make when we walk through all the snow we have!! We have over a foot of snow that all cam on Christmas and then yesterday. Sister Woodbury got her first white Christmas!! It was awesome!! We had a lot of fun and got a lot of work done!! Bawm! SO let's get started! Christmas Day was even more busy than last year--I didn't think it was possible!! We woke up at 5:30 to open our presents, which was REALLY early btw. I won't ever do THAT again! haha but we got all glammed up to talk to our families and then went to our first appointment (so we didn't get our studies) with the Klers. We shared a Christmas message with them and it was a great way to start off the day! When we woke up at 5:30, it was just starting to snow, and it snowed for like 36 or so hours, so we got a LOT of it! We then went back to the Nicholls and ate breakfast with them and had the best breakfast I have ever had on my mission, hands down! We had paleo waffles (so healthy!) with raspberries, whipped cream and coconut syrup!! Oh man, I'm not a fan of coconut, but that syrup was so dang good! We also had eggs, bacon, egg nog and SImply Apple juice! It was a great pre-skyping meal!! 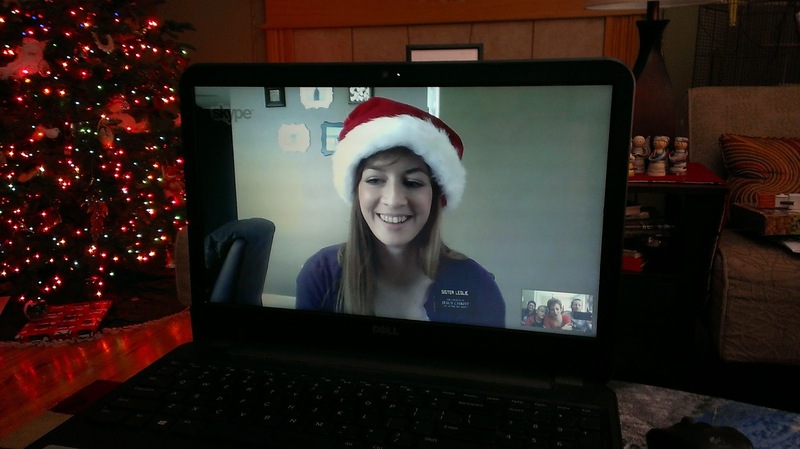 I then got to skype with my awesome family, and I almost died when I heard Tyler speak and saw how tall he is!! I still am freaking out!! Skyping this time was fun, but so WEIRD!! My siblings kept asking when I come home, and I just kept shutting them down, haha. Poor kids. But I'm still in denial that I don't have long left! As far as I'm concerned, next time I see them will be skyping on Mother's Day, haha! (juuust kidding family! But not really). SO that was fun!! We met with Brooklyn and her family before going to the Winn's to eat Christmas Dinner and it was fantastic!! It was great!! :) We also got to meet with a new-to-us less active couple, the LUdeman's. They are so old and so cute!! We enjoyed it a lot! Our other 2 appointments fell through, but we got in with another less active before calling it a night. We were pooped by the end of the night!! It was a crazy busy day! And, Casper stinks at plowing their roads! I need to get a picture of how they do it:they push the snow ito the MIDDLE of the road so if you have to turn left into someone's driveway, you either have to mound the 4 foot snow pile or go flip a u turn somewhere--it's ridiculous! There were a lot of people who were late to church on Sunday because they couldn't get out of their driveways! And the awful wind here doesn't help! Some members had 5 foot drifts--yeesh. Pete is doing great!! We had a fantastic lesson with him this week, well 2 actually. The first went okay, Pete was really stressed out, so he got a priesthood blessing and he seemed indifferent to it, but the next time we met with him was very different. Pete walked in with a huge grin and on his face and told us after we started the lesson that the priesthood blessing had helped him immensely and his shoulder, which had been hurting before, hadn't hurt in 3 days since our last lesson. Amazing!! He kept saying how much he felt the Spirit and he looked so happy. He was convinced that day was the best day of his life!!! SO that was really neat. He's doing awesome. That's probably the most exciting news of the week! Enjoy the pictures! I love you all!